Incremental concessions haven’t improved our image nor won us popularity and understanding abroad. They merely cost us any residue of legitimacy and burdened us with the onus for more giveaways (because our illegitimacy entitles us to nothing). We vacated every last inch of south Lebanon and Gaza only to see Hezbollah and Hamas respectively grab power and amass rocket arsenals with which to occasionally attack our population centers. Nonetheless, we increasingly hesitate to defend ourselves because our self-defense has also been delegitimized. Loss of deterrent boosts enemy impudence. This hasn’t been lost on the con men from Ramallah who headline the Palestinian Authority, which, despite its inherent inviability and unreliability, stars as the world’s darling. In his own none-too-endearing manner, even Syria’s Bashar Assad had, for most of his time in power, managed to hold on to his unofficial but very useful fan club. It was no accident President Barack Obama returned the US ambassador to ostracized Syria after a five-year absence. Somehow rapport with the bad-boy bully was supposed to help the US extricate itself from Iraq. That, at least, was what the Harvard-honed logic of America’s commander-in-chief dictated. Obama’s sweet illusion was remarkably not soured by the fact that Iran’s alliance meant far more to Assad than Washington’s nebulous goodwill. Unsurprisingly, the White House resident and perfidious Europe tell little unloved Israel that it ought to inordinately imperil itself to indulge the Damascus despot. Predictably, our priests of pragmatism rush with alacrity to ingratiate themselves and decree that by merely ceding the Golan Heights to benign Syrian rule, we’d be blessed with blissful peace. Syria, they aver, is the key. How can they be sure? Trust them. They’re omniscient. We have their own say-so for it. Frustratingly, though, events appear to unfairly conspire and undermine the self-professed infallibility of our homegrown advocates of expediency. These in-house experts uncannily perceived the agreeable aspect of Assad, the lanky ophthalmologist with a supposed Western orientation. Yet, confoundingly, Assad’s own citizenry is less mesmerized. Whether or not reality meshes with established Israeli wishful thinking, Assad isn’t the gawky guy next door who might make a nifty neighbor if we only try hard enough to win him over. 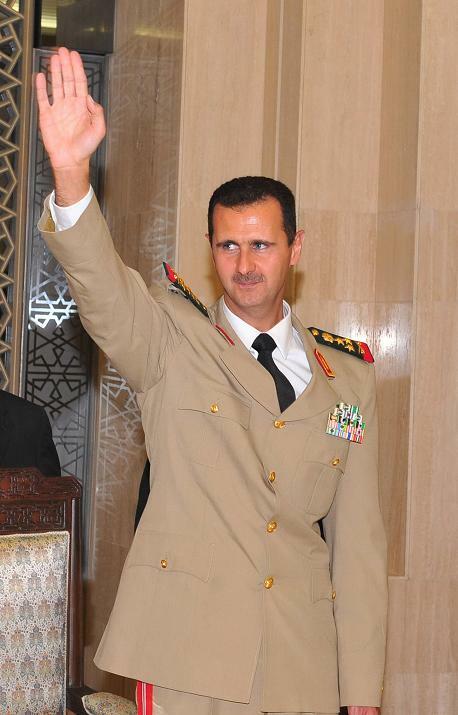 Assad may look less tyrannical than his father, Hafez, but he’s no less of a brute (with nuclear ambitions to boot). Like his dad, he imposes a minority sect’s hegemony over a majority that despises his faction/clan. If anything, the agitation in Assad’s latifundia underscores doubts about bargains struck with autocratic regimes without their people’s authentic backing. Contrary to our indefatigable peace-purveyors, paying off assorted dictators to secure a semblance of accommodation is a losing proposition, because eventually these rulers will disappear. With them will vanish the peace we shelled out for. Worst yet, there’s no Better Business Bureau or Customer Service to refund our hefty, tangible and eminently dicey investment in land-for-peace fantasies. In these dangerous days, it’d be quasi-comforting to trust that our opinion-molders’ prudent motto is caveat emptor – buyer beware. Alas, however, that’s decidedly not the case. Thank heavens the Golan is still ours, a buffer between our small sliver of a state and the Syrian mayhem. Imagine our misfortune if Assad’s tanks were parked on the shores of Lake Kinneret. Those who insistently brainwashed us that this is what’s prescribed for our national well-being should beat their own breasts in contrition. In other words, repentance is worthier than absolute righteousness. In keeping with the tolerance subliminally inculcated into us, we’d magnanimously welcome all remorseful wisenheimers who confess the error of their ways. But where are the penitents? There’s no hint of an indication that the self-proclaimed sane ones have at long belated last arrived at the sensible conclusion that any peace which lacks grassroots popular approval is nothing but a false façade – especially when, instead of conditioning the masses to coexistence, the purported peace-partners actively demonize us, incite to violence and idolize terrorist mass-murderers. That’s what Mahmoud Abbas, Salam Fayyad and other PA honchos do via what they sanction in their public schools, mosques and mass media. Seeking compromises with here-today-gone-tomorrow elites isn’t only counterproductive, it’s potentially suicidal for us. Moreover, these hotshots preside over artificial nationalities, the products of imperialist – mostly post-World War I – machinations. Iraq, Syria/Lebanon, Jordan/ Palestine, Libya, the Gulf concoctions are all tribal-sectarian-religious mishmashes. When the glue of totalitarianism is strong enough, the hodgepodge holds together. When the adhesive weakens, for whatever pretext, internal strife bursts ferociously into the fore. In Syria, Iraq and even tiny Bahrain we witness religious communities and extended clan formations slug it out (as is the case in Lebanon for decades). In Yemen and Libya it’s gloried tribal conflict captivating clueless 21st-century news-consumers. We cannot by the magic of our aspirations conjure peace-partners. Anything we might forgo for fraudulent fly-by-night figureheads would sink down history’s drain. All our sacrifices and suffering – including some 2,000 Israelis slain since Oslo – would have been for naught. Besides, let’s presume that our know-it-alls truly do know it all and that all the region’s dreadful regimes prove sturdy and sound. Would we really want to partner up with their unscrupulous like? This goes beyond the issue of feasibility and the durability of any hypothetical negotiated deal. This question tests the sincerity of those who present themselves as the guardians of our collective conscience and who urge us to take existential risks for the sake of what they perceive as human rights (invariably Arab rights). Is it reasonable to accept that unreasonable demands be required of beleaguered democratic Israel, but that aggressive unconscionable Arab regimes be absolved of even a modicum of decency? Apparently so, because precisely such an egregious double standard plagues us unremittingly. It’s furthermore maddeningly accompanied by our own domestic discordant cacophony. Those within our embattled society, who obsessively orchestrate the disharmony, haven’t the ethics or gumption to admit their blunder. Blithely, they overlook the fact that all the bleak risk assessments vis-à-vis their foolhardy Oslo-spawned misadventures have been vindicated. Don’t expect them to admit that it’s imbecilic to push for more territorial surrenders. Heck no. To hear them, nothing panned out because the anti-appeasement crowd didn’t let them cede even more. So where are the penitents? They’re ever busy promoting peace with … whoever. A quote from Sarah Honig’s article in the Jerusalem Post: Where are the penitents? (http://www.jpost.com/Magazine/Opinion/Article.aspx?id=215615) clearly illustrates the maniacal, self-destructive psychosis of Israel’s lemming-Left, the ruling elite that is dragging ALL of Israel off the cliff into the sea. In plain English, what it really mean is that Israel could have come to an agreement with the Assad regime, which would have been called a “peace agreement” but whoever overthrows him might not be willing to sit and negotiate with Israel. Even willing to assume that Assad would have kept any part of any agreement with Israel, which would be quite a stretch of credulity, is insane. Just look where Egypt is at, clearly teetering towards undoing the cold peace agreement it has with Israel. Already Israel has been told by a prospective next Presidents of Egypt, that Israel had a peace agreement with Mubarak but not with Egypt and, now, that Mubarak is out, there is really no agreement! So what the idiot savants at Ha’aretz really mean is that Israel could have unloaded the Golan Heights to Syria by coming to a worthless agreement with Assad before he gets thrown out of power and then, that agreement comes to zero nothing for Israel and a reversal to 1967, where canons on the Golan Height kept the Jordan Valley residents in shelters, below ground level, much more than they could emerge and lead a normal quiet life above ground. Only insanity could bring about to say, what an opportunity Israel has squandered! The Leftists walk among us and they vote and they reproduce. Even more than that, they own the country and control all of its institutions of power. Their representatives make all the detrimental decisions in Israel. Israel needs to declare, over and over again, a perpetual sovereignty in the Golan Heights. Sarah Honig has some choice of words to say to ALL Israelis, which is very worthwhile reading and beware of. Today I saw a car with a bumper sticker (in the US) that proclaimed, “I am for peace!” Well, hot damn, I thought to myself, because I am for motherhood and apple pie. We’re such good people, us two.